Ford has the habit of stealing the Detroit Auto Show, and this year will be no exception. 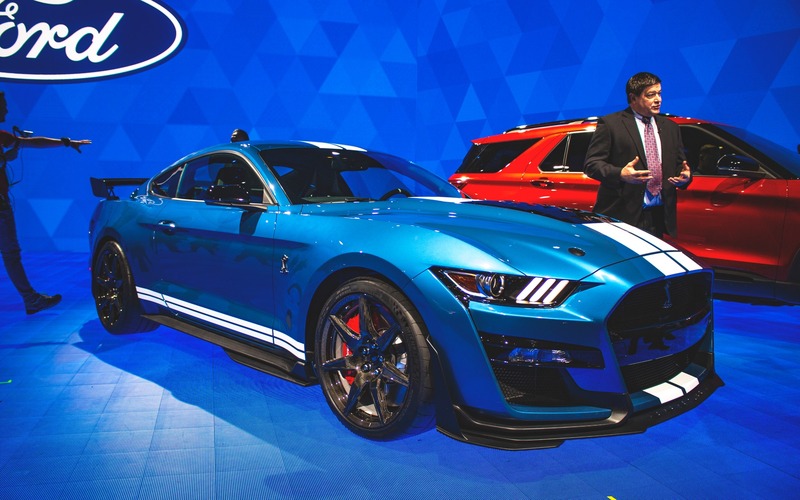 The automaker from Dearborn started off the new year with a bang by unveiling its new Mustang Shelby GT500. With the Shelby GT500, Ford is launching what will be the most powerful production Mustang to hit the streets. Not bad for a model that is blowing 55 candles on its birthday cake this year. At the heart of the beast lurks a hand-built, supercharged, 5.2-litre V8 with an aluminum block. Ford hasn’t announced specific output details, but promised more than 700 horsepower. With the Mustang Shelby GT500, Ford is set to rival models such as the Chevrolet Camaro ZL1 and the Dodge Challenger SRT Hellcat, whose new Redeye variant proposes an unbelievable cavalry of 797 horsepower! Again, without giving precise numbers, Ford says the GT500 can accelerate from 0 to 100 km/h in less than four seconds and clear the quarter-mile in less than 11 seconds. These stats are obviously accomplished thanks to the Mustang Shelby’s engine, but also to its new dual-clutch, seven-speed automated transmission. Those who prefer rowing their own gears will have to settle for the 526-horsepower Shelby GT350. Aerodynamics also plays a huge role with the Mustang Shelby GT500, as is downforce optimized by a widened body and a fully functional rear spoiler. Ford also points out that it fit the car with a magnetorheological suspension in order to enhance handling characteristics. Inside, the GT500 is equipped with a fully digital, 12-inch driver instrument pod as well as an eight-inch touchscreen to control the SYNC3 infotainment system. As if the sound of the V8 wasn’t enough, Ford is also offering a 12-speaker Bang & Olufsen stereo. The 2020 Ford Mustang Shelby GT500 will arrive in dealerships next fall. However, pricing hasn’t yet been announced. Ces statistiques, la Mustang Shelby les doit évidemment à son moteur, mais aussi à une nouvelle boîte automatique à sept rapports avec double embrayage. Pour ceux qui chercheraient la boîte manuelle, oubliez ça tout de suite. Il faudra vous contenter de la Shelby GT350 et de ses 526 chevaux. News 2020 Ford Mustang Shelby GT500: 700 HP… and a Speed Limit?